The Prosecco hills, located between Valdobbiadene and Conegliano, represent a start point for suggestive itineraries. The land itself, between the Dolomites and the valley, becomes a fascinating scenery with strong, distinguishing features, most af all, the vineyards. 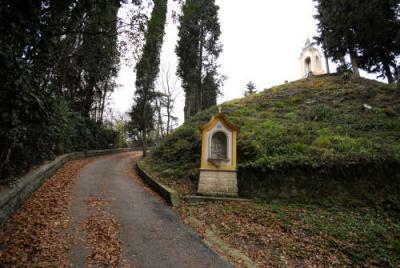 The Prosecco Road definitely represent one of the most interesting itineraries. With its total 120 kilometres, penetrating and scrambling along the hills from Conegliano to Valdobbiadene, the enological artery drives the visitor through uninterrupted vineyards and villages where people can breathe the taste of the art of wine, giving glimpse and landscapes of authentic beauty and charm, together with medieval statements, hermitages, churches, signs of the rural, civil and religious history. Not to forgive the chance to meet the cuisine and the local products in all the traditional restaurants scattered along the wine road. But the road especially offers the opportunity to choose the itinerary closer to one's own sensitivity and predilection. Following the Prosecco Road you may even explore the area keeping fit. In fact, there are many routes for cyclists, with different lenght and difficulty, for both road and mountain bike. They vary from the comfortable network of cycling lane crossing the valley and surrounding the hills, to the more demanding cyclist tours on the foothills and on the “Montello's” ridge. For off-road cyclists instead, there is a wealth of choices, for example the trail of the citadels between Asolo and Cornuda, the ring of Pianezze-Monte Cesen, the Piave riverbed and many more. Moreover, many shelters and trails make Valdobbiadene a perfect start point for excursions and strolls between hills and passes. Also in this case, the levels of difficulty change from the quite easy strolls to the trekking and nordic walking routes. Very interesting is also the discover of the 1st World War (1915-1918), struggled on those hills and mountains, as well as on the shores of the Piave river, fundamental point for the battle evolution. 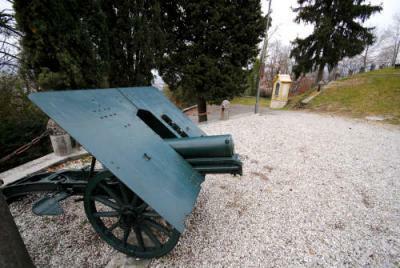 To see the Military Memorial in Nervesa della Battaglia and, more in general, the itineraries around Montello, on the traces of the Great War. The “Tipoteca” in Crocetta del Montello hosts visitors and activities in a unique, funcional space: 2000 square meters dedicated to typography and the art of books. The exhibition itinerary introduces spectators to the knowledge of print instruments, with original documents and objects. Some individual positions show trhough videoclips the history of the Font and his implementation in the visual communication. “Tipoteca Museum” offers permanently a series of deft supports to the visit. The museum is open all year and is handicap accesible. 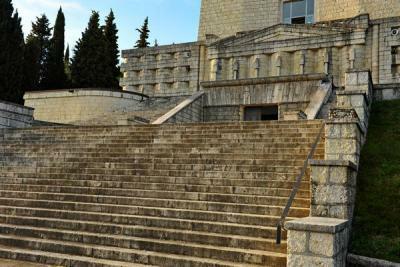 Guided tours are availble in italian or english. The Museum of Boot and athletic Footwear of Montebelluna is located in a historical Villa of the XVI century, accurately restored. It conserves more than 2000 objects connected to the world of design, technological innovation and production of sport footwear, which historically represent the result of “know how”, characteristic of the district. Possagno is the homeland of the most important neoclassical sculptor Antonio Canova. The solemn Gipsoteca realized in 1836 collects almost all the authentic models of his sculptures, the sketches of 'terracotta', drawings and paintings. The Canova's Museum is exactly the icon of his art and life. Here is preserved his memory, in obedience to his brother's (Giovanni Battista Sartori) wishes. Today this reality represent an essential reference point for the museums all over the world that thoroughly guard the marble masterpieces, expression of his brilliance.